Rebecca Theim is a former staff writer with the Times-Picayune and the South Florida Sun-Sentinel. Following a fifteen-year career in corporate PR after leaving the newspaper business, she became involved in the ultimately unsuccessful efforts to save daily publication of the Times-Picayune and founded the nonprofit dashTHIRTYdash to raise awareness about the changes at the newspaper and money for the hundreds of employees who lost their jobs. 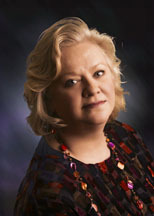 Theim earned her bachelor’s degree in journalism and master’s degree in marketing communications from Northwestern University, and a second master’s degree in journalism from Ohio State University, where she was a fellow in the then-yearlong Kiplinger Mid-Career Program in Public Affairs Reporting endowed by the Kiplinger media family. She and her family live near outside of Washington, D.C.